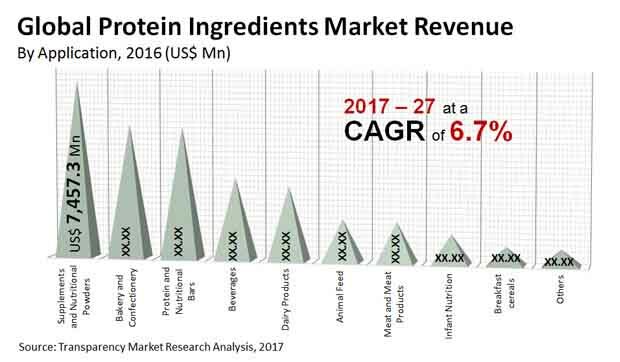 Presence of numerous players owing to low entry barriers makes the global protein ingredients market highly fragmented. It is competitive too. In order to thrive in such a cutthroat overcrowded space, nimble players are seen banking upon product development. This is definitely having a positive impact on the global protein market. Apart from that, increasing popularity of pea and soy proteins is also proving beneficial for the market. Growing demand for dairy products and eggs is benefitting the global protein ingredients market too. A noticeable trend in the market is the demand for “purer” products with reduced processing. This has led to development of newer products, namely native whey and micellar casein. This is further positively impacting the global protein ingredients market. Rise of convenience foods with added nutrients and the growing preference for fortified foods is another factor helping demand in the global protein ingredients market. One drawback, which the market has to contend with, is the comparatively reduced consumption of plant proteins and the harmful effects of gelatin. As per a report on the global protein ingredients market by Transparency Market Research, it would rise at a steady 6.5% CAGR between 2017 and 2027. At this pace, the market which was worth US$31.8 bn in 2016 will likely become worth US$64.35 bn by 2027. The two main types of products in the global protein ingredients market are animal protein and plant protein. Plant proteins ingredients are mainly derived from wheat, soy, and pea. Meanwhile, animal protein ingredients are derived from eggs, caseinates, and animals. Between the two, the segment of animal protein currently leads the market with an outsize share in revenue generation. In 2016, as per the TMR report, it accounted for almost 80.0% share in the protein ingredients market. This is because of the rising consumption of dairy products and eggs. In the upcoming years, demand for soy protein is predicted to rise at a speedy pace because of the increasing usage of concentrates, soy isolates, and texturized vegetable proteins. Depending upon the form again, the global protein ingredients market is segmented into concentrates and isolates. Between the two, the protein concentrates enjoy a greater share in the market. From a geographical standpoint, the global protein ingredients market is spread across North America, Europe, Latin America, the Middle East and Africa, and Asia Pacific. Among them, North America accounts for a leading position owing to the highly developed food and beverage industry and the increased spending capacity of people in the region. In 2016, North America led the market with a revenue contribution of US$11.96 bn. Going forward, the North America protein ingredients market is set to rise further to maintain its leading position because of the solid awareness among people about the health benefits of protein. Europe also holds a prominent position in the global protein ingredients market. However, both Europe and North America market have become saturated. This has egged savvy players in the regions to go for product innovation to grow sales. Meanwhile, this has also led most to turn their gaze upon Asia Pacific and Latin America which are developing protein ingredients market. Some of the prominent participants in the global protein ingredients market are Cargill Plc., Glanbia Plc., Archer Daniels Midland Co., Solae LLC, and Kerry Group Plc. Transparency Market Research (TMR) offer a 10-year forecast for the protein ingredients market between 2017 and 2027. In terms of value, the market is expected to register a CAGR of 6.5% during the projected period. The primary objective of the report is to offer insights on the advancements in the protein ingredients market. The study demonstrates market dynamics that are expected to influence the current environment and future status of the global protein ingredients market over the forecast period. The primary objective of this report is to offer updates on trends, drivers, restraints, value forecasts, and opportunities for manufacturers operating in the global Protein Ingredients market. Growing popularity of plant protein ingredients is expected to push certain key products, such as soy and pea proteins to grow at high rates over the forecast period. But this growth is offset by relatively lower overall consumption of plant proteins. Despite the decreasing popularity of gelatin, egg and dairy products are expected to witness considerable demand in the future. Increasing consumer demand for ‘purer’ products with low processing is enabling development of new products such as micellar casein and native whey. The other factors driving the market are increasing adoption of protein ingredients in food and beverage products, and growing consumer preference for fortified foods or foods enriched with protein ingredients. A section of report discusses the overall competitive landscape of the protein ingredients market. Every protein type has many market leaders, with most of them belonging to Europe or North America. The market is slightly fragmented in Asia Pacific and Latin America. Various barriers to entry in the industry are analyzed and rated on the basis of their impact on the competition level in the market. The report analyses the market share of the protein ingredients on the basis of product type, application, product form and region. On the basis of product type, the market is segmented into plant and animal proteins. Plant protein segment is further sub-segmented into soy, wheat, pea and others while the animal protein segment is further sub-segmented into whey protein, casein and caseinates, egg protein and gelatin. Animal protein segment is estimated to account for around 80% revenue share in the global market over the forecast period. Along with high consumption, the high prices of eggs and dairy proteins is the major factor impacting the animal protein segment. Soy proteins sub-segment accounts for significant value and volume share owing to a historically high usage of soy isolate, concentrates and texturized vegetable proteins. In addition, it is imperative to note that in an ever-fluctuating global economy, we not only conduct forecasts in terms of CAGR, but also analyze on the basis of key parameters such as year-on-year (Y-o-Y) growth to understand the predictability of the market and to identify the right opportunities. Also, another key feature of this report is the analysis of all key segments in terms of absolute dollar. This is traditionally overlooked while forecasting the market. However, absolute dollar opportunity is critical in assessing the level of opportunity that a provider can look to achieve, as well as to identify potential resources from a sales and delivery perspective in the global Protein Ingredients market. A section of the report highlights protein ingredients demand, region-wise. It provides a market outlook for 2017–2027 and sets the forecast within the context of the protein ingredients ecosystem, including the new technological developments as well as product offerings in the global protein ingredients market. This study discusses key region trends contributing to growth of the protein ingredients market globally, as well as analyses the degree to which drivers are influencing the market in each region. Key regions assessed in this report include North America, Latin America, Europe, Asia Pacific, and Middle East and Africa. In the final section of the report, a competitive landscape has been included to provide report audiences with a dashboard view. Key categories of providers covered in the report are protein ingredients suppliers and customers. Detailed profiles of the providers are also included in the scope of the report to evaluate their long-term and short-term strategies, key offerings and recent developments in the Protein Ingredients space. Key players in the global protein ingredients market include Protein Ingredients suppliers and customers. Protein Ingredients manufacturers include Solae LLC, Archer Daniels Midland Company, Cargill Inc., Glanbia plc, DMV International B.V, Kerry Group plc, ROQUETTE FRERES S.A, Davisco Foods International, Inc., Arla Food Ingredients, and Sterling Biotech Ltd.